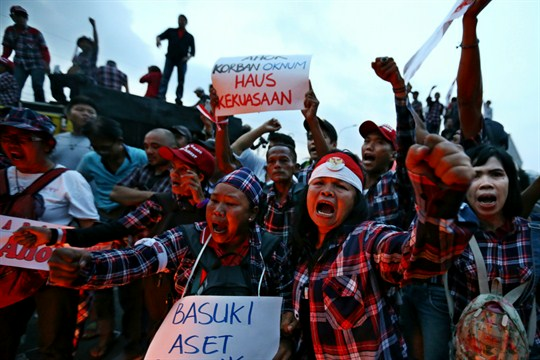 Supporters of former Jakarta Governor Basuki “Ahok” Tjahaja Purnama shout slogans during a rally after a court sentenced him to two years in prison, Jakarta, May 9, 2017 (AP photo by Dita Alangkara). In this week’s Trend Lines podcast, WPR’s editor-in-chief, Judah Grunstein, senior editor, Frederick Deknatel, and associate editor, Omar H. Rahman, discuss the Trump administration’s move to decertify the Iran nuclear deal and what it means for U.S. foreign policy in the Middle East. For the Report, Emirza Adi Syailendra talks with Peter Dörrie about why 19 years after the fall of Suharto, Indonesia’s democracy remains tenuous and its institutions weak.